Yes, we have a new blog. Bear with us. Like our lives, our new site is a major work in progress. Some pages aren’t even started yet, but they will evolve over time. 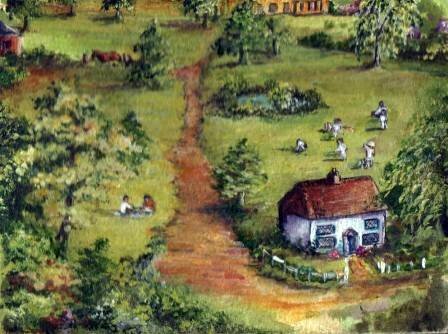 We’ll be sharing our adventures in creating a little urban farmstead, including information and helpful links. Over time, we see a site that will have funny family videos, and hook people up with our eggs and chickening as well as produce (granted, that may take a few years). We’ll eventually offer e-books, crafts, and who knows what else. We have a lot up our sleeves! I want to thank everyone who sent us suggestions. They were all a lot of fun. We’ve never named property before… well, we actually named the land we have in Colorado “Peebleshire” but that was a no-brainer that came to us the first day we saw it. It literally looks and feels like a shire, and “Peebleshire” is a town in Scotland where Daniel’s ancestors are from. This property was more difficult. It’s on a semi-suburban street with a very rural feeling. Lined with Elm trees, and the most gorgeous Maple in town, it has a lot of history, and backs up to a river. This left us so many possibilities… the list was long. We wanted “Love” to be a part of the name somehow. It was a difficult process, but we all finally agreed on “River of Love” because it really fits. Not just in a literal sense with the river, but also because of the endless flow of love we’ll be pouring into the property. Whew! I’m relieved to have that out of the way. Somehow, a name seems to bring the property to life and gives it a sense of spirit. It’s a turning point. Now we’re excited about designing a new website that’s devoted primarily to our little farmstead adventures. We’re hoping it can be a resource for others, as well as a place to post recipes, sell goodies and handmade items, gardening tips and disasters, conscious parenting ideas, ecological solutions and rants, family video clips, and spiritual inspiration. We’ve been brainstorming for months, and it’s looking like we just can’t come up with the right name for our mini farmstead. We’d like to come up with one before our first growing season. If there’s an idea in your head, feel free to offer a few suggestions. At the very least, they could guide us in the right direction. You can post suggestions here, or e-mail me at jillpeebles@yahoo.com. Daniel and I have been spending a lot of time visualizing, dreaming, and scheming about our lives. The past two weeks we’ve been sitting down with the purpose of researching and deciding what to do next, and how we see ourselves living over the next 2-5 years. Mainly, how we can simplify and live an even more happy, self-sustaining life of freedom. We’re about to enter our first growing season here, so we’re on the edge of our seats with anticipation. The possibilities are endless on our property, but nothing will be accomplished very well without focus and clarity. I’ve no doubt we’ll be making mistake after mistake along the way, but we’re hoping to find joy in every step. TO START: We didn’t come to many conclusions, but one thing we know for certain– we’re doing exactly what we should be doing, right now. 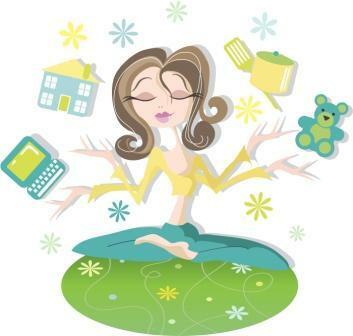 Gradually, our lives are becoming simpler and far less stressful. Daniel is working about 30-40% less than he did a year ago, so he’s home A LOT more. We have far fewer expenses, so we’re enjoying a healthier diet…. with a very low mortgage we can afford to purchase more organic foods and products. We’re much more physically active than we were a year ago, so we’re experiencing a lot of the benefits we’d hoped for. DEBT FREE: Yesterday, I sent off the last payment on our very last credit card (due to taxes, we waited to send the funds in 2011). It’s extremely liberating to know we don’t have those clusters of little debts hanging over our heads. Some of the debt was lingering from our trips to India and Ethiopia, and we’re free now. They’re ALL GONE, and we’ll be canceling the card. The only card we’re keeping is an American Express card, but Daniel changed it to a no annual fee card and we’re keeping it in a drawer with a zero balance. We have eliminated any and all store cards, and have vowed to never purchase an appliance with credit, even if it’s 18 months no interest. We’re having a new kitchen floor installed, and have saved every penny in cash to pay for it. No credit cards ever again for anything. Hallelujah! DEBT FREE II: We still have our auto debts, so we’re counting down the days until we at least have ownership of them. We’ve recently vowed to NEVER AGAIN purchase a brand new car (a complete waste of money, even if you’re wealthy), and ideally hope to purchase any future vehicles with cash. Somehow, automobile debt has become a ‘way of life’ for most Americans. I don’t accept that ball & chain way of being. We’re currently looking into the possibility of selling one of our cars just to get out from another debt… more freedom, YES!!! It’s complicated, but if it appears to be a better choice than continuing the loan for 3-4 more years, then we’ll jump at it. OVERHEAD: There is a strong possibility that we will be dropping all phone book advertising for Daniel’s law practice. This would reduce a massive overhead expense… more freedom, YES!!! Less clients, you say? After talking with other attorneys who have done the same (some skip a year or two in the Yellow Pages), he’s discovered it didn’t hurt business much. After 11 years here, Daniel gets a great deal of word-of-mouth referrals, and people hang on to their old phone books for years. Mainly, more people are turning to web searches when seeking legal counsel. Getting at the top of search engines is far less expensive than the phone book, and it’s greener, too! EGGS: I’m noticing that we spend significantly less money on afternoon meals just because of the chicken eggs. I’m usually whipping up something with them a minimum of 5 days a week, and it just dawned on me how much I’m not buying at the store because of that. I keep meaning to post about how amazing it is to take care of and love animals who also provide me with physical nourishment. Being a city/suburbanite, this is the first time I’ve ever experienced this harmonious cycle. My eating is accompanied by a feeling of warmth and gratitude to our sweet hens. To be able to make that connection with my food is an indescribable feeling… I could never go back to eating store eggs again. LAUNDRY: Big topic in our family because it’s a big job that seems to run 24/7. I do my best to take Wednesdays off from laundry, but can’t always do it. I honestly cannot wait to get back to hanging our laundry outside again. I took out an old sheet that had been folded in the closet since the Fall. It had been dried outdoors, and the smell was still there. I plunged my face deep into it, inhaling deeply. I really miss that smell, but most of all I miss the act of going outdoors with my basket of wet laundry, and standing on the earth with the trees swaying around me. It gets you outside, which is the greatest therapy of all. On a practical note- our dryer is a major energy hog. All dryers are. I read somewhere that each cycle can run anywhere from $1-$2 a load. With our large family, the laundry line pays for itself, and then some. Not to mention all the carbon emissions they give off, and how damaging they are to clothes. Did you know that dryer sheets contain ingredients made from animal fats (animal tallow)? Yuck.. we don’t use them. Check out thistoxic list of ingredients and alternatives if you’re really attached to dryer sheets. If it was just Daniel and I, I would sell off the dryer and hang clothes year round. I’ve considered doing it now, but we just don’t have the space to hang that much indoors. 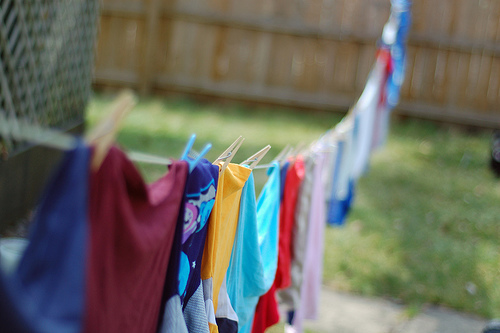 The MOST surprising thing about using a clothes line is how much easier it is to do a load of laundry when you hang it outside to dry- I expected it to be far more effort, but instead it feels much easier. Maybe because it breaks the steps down more, or because it’s so enjoyable. I now despise getting large piles of dry laundry out of the dryer and sorting through them. It’s those ugly piles that make laundry such a pain. One thing we have agreed to do is re-wear clothes as often as possible, to hand wash more often, and hang heavy clothes indoors like jeans and towels. I’ve recently discovered that hanging dry, but musty clothes outdoors in the Winter helps to air out and freshen them considerably. GARDEN PLANNING: I’ve recently been working overtime to plan our 8′ X 4′ raised veggie garden beds. We have two ready for Spring, but will be adding at least 1-2 more in March. I found some great software for the beds themselves, but haven’t found anything to design the entire layout of all the beds. I’m realizing how much we’ve become computer-dependent… it’s ridiculous. I remember17 years ago when I was planning flower gardens and used a sketch pad that worked out perfectly. Time for me to get another sketch pad and go to town! It looks like we’ll be having a large salsa garden, and another bed with vining plants like squash, peas and green beans. We’ll be ordering blueberry bushes in the mail, and devote a whole bed to those. UNNECESSARY NECESSITIES: Today I said “Goodbye” to my blow dryer, for good. It was sitting in my drawer today and I started thinking about how I’m using it less and less, and the days I do, it’s not really necessary. I thought about all the damage it causes my already dry textured hair, and the electricity it drains. I also considered the obnoxious noise of it and how all I really need to do is make sure I wash my hair well before I need to be anywhere. I don’t know if I ever mentioned it, but we don’t use paper towels any more, except for pet accidents. Cloths work extremely well, and after 6-7 months I’ve no complaints about it. Daniel and I both recently agreed we’re going to shower/bathe less. This may seem disgusting to some,considering we live in a soap and suds-obsessed culture that believes in the very modern idea that bathing is necessary on a daily basis. It’s not, and I’m learning that. Especially during Winter months when my skin gets so dry it itches and cracks. If I skip a day of bathing, my skin feels better off, not to mention the chemicals in soaps we’re not exposed to day after day. We’re going to discuss this with the kids and come up with a plan to see if we can reduce the amount of water consumption in a significant way. There are viable alternatives to daily baths and showers that really work… I have a feeling Sorin will be the only one who has trouble with this in the beginning, but she’ll come around. LAST BUT NOT LEAST: We’re brainstorming creative ways to generate supplementary income. The more we can do that, Daniel will be working less and less in his law business. He wants out entirely, and he wants out now. We know it’s going to be a gradual process, but it’s definitely going to happen. We’ve come up with a lot of great ideas, and we’ll see how things pan out over time. This process of saying goodbye to an old way of thinking and living takes time, trust, patience, and a regular practice of self-analyzing. We are always asking ourselves “Will this decision make us more free and happy?” and if so,”Why?” We always know we’re doing the right thing when when it results in more happiness and peace of mind. We find ourselves more happy now than at any other time in our lives. Could it get any better? Jasmine standing on their treat block (a condensed block of seed and grains). They were outside Monday, under the coop, but haven't been out since. Last night was the coldest night so far this Winter. It hit a negative four degrees, and when I fell asleep I couldn’t help feeling sorry for our three hens. I have to keep reminding myself that they’re birds, and birds have survived Winters in our trees, year after year. They’re also birds with thick plumage, and don’t experience cold the way we or our other animals might. They’re not very comfortable, and are definitely not happy, but they are okay. 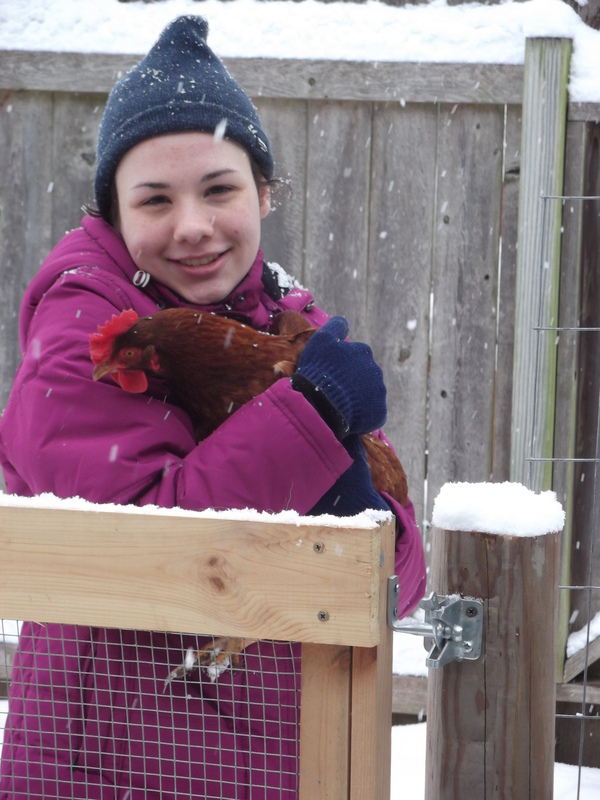 The biggest risk with chickens in the cold is their combs and wattles (the fleshy red areas on their heads and chins). Those parts are prone to frostbite, so I’ve been checking them daily. I’ve read it helps to seal them with Vaseline, so I may try that this evening… another biting cold night is on the way. They have adequate ventilation in the coop (cracks, holes, a drafty window), which keeps their breath from creating a build-up of moisture in the air, resulting in frostbite. For this reason, I don’t keep water inside the coop, except during the day when they won’t come out. Yup, yesterday they surprised me by not coming out of the coop, even after I opened the door. I was amazed. Normally they’re dying to get out, but not yesterday with five inches of snow on the ground, and a cold that felt downright evil. I had to bring food into their house, and a small bowl of lukewarm water. They poke their heads outside the front door, and squawk a little, then immediately go back inside. They’re saying, “Holy Lord, help us. This is nuts!” Talk about being “cooped up,” they’ve got to be going a bit stir-crazy together. Again, when I opened their door this morning, they would not come outside. I’m considering shoveling an area of ground off so they can come out and peck around, snow-free. I just don’t know if the cold will allow for that… they despise it. To increase their coop temperature for night time, I turn on a red heat lamp at sunset, and leave it on until about 11:30pm. The coop gets pretty warm (anywhere from 30-40 degrees), and then gradually drops off for about 6-7 hours while they sleep. 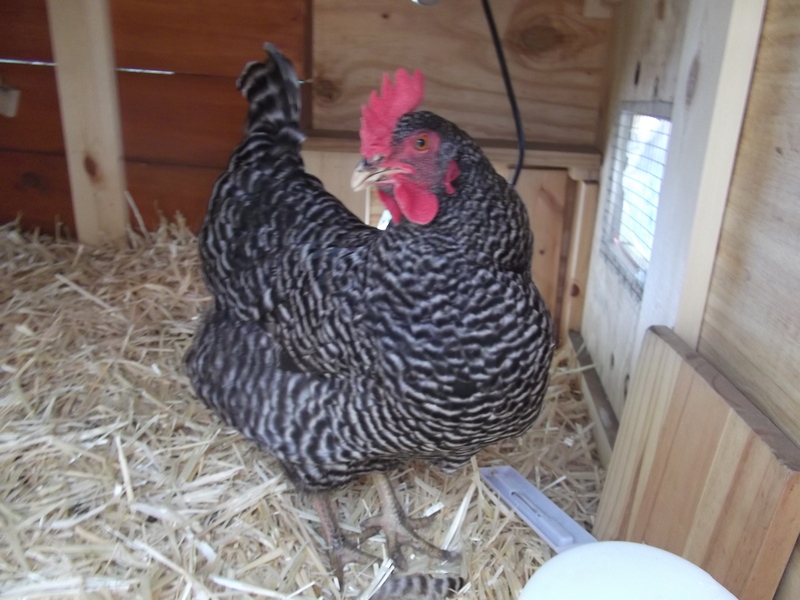 Without the lamp, I’ve noticed the coop stays about 10-15 degrees warmer than the outside temp. In the morning, we turn the lamp back on between 6:00 and 7:00 am. Today is the first day I’ve chosen to leave it on until about 11:00am. the South sun will be warming the house soon, and I’ll shut it off. I’m making sure to give them extra calories, which I’ve read is one of the most important things to do for chickens in the cold- oatmeal, table scraps, and bread crumbs sprinkled on the coop floor. Hens will often stop laying eggs in order to conserve energy, but they’ve been laying at regular production levels through all this stress. I feel very sorry for my girls, mainly because they’re not having any fun. Most importantly, I do know they’ll be okay. I’m impressed with how well they’re actually doing. 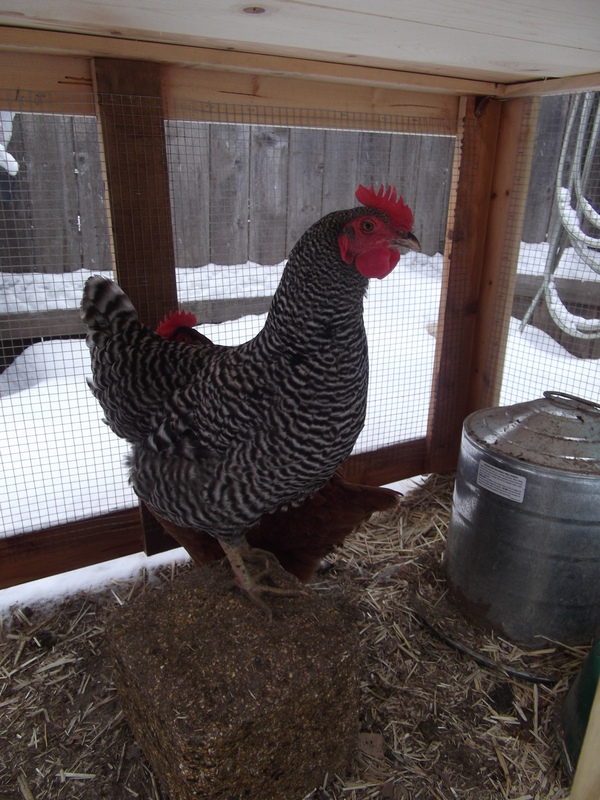 Before getting chickens, this was my biggest concern– keeping animals outside during negative temps. It’s just a cold snap, and we’ll be back into the 30’s and 40’s before we know it. I can just see them running and squawking out of the coop with such joy when that happens! My kids are feeling a bit like that today, considering they finally returned to school today. What is the deal with this? It’s probably been going on for thousands of years, and it really does make parenting about 25% more difficult. There are some things I can’t ignore, like Amelie choosing to stand up on the back of her trike, eat off the floor, or the boys starting a yelling match in the next room. I have to drop what I’m doing, which is usually something enjoyable, nourishing and therapeutic, just to keep the peace and safety in this house. And these things happen, the majority of the time, when I am having fun or enjoying myself. It’s got to be a conspiracy of some sort. Maybe not for Amelie… not yet, anyway. But I know for a fact that Sky plans on how difficult he is, or isn’t going to be. He tells me. Just yesterday he said, “Prasad and I had a serious discussion today, Mom, and we’ve both decided that we’re going to give you a day of peace.” I was stumped. It’s a considerate gesture, but my first thought was “Why does this have to be a plan. Isn’t being respectful and mindful a given?” No… it isn’t with children. They often like to believe they have buttons to push, and can control their parents’ lives, moods, and daily affairs with their bahaviors. Many kids do, and they have learned that behaviors are valuable tools. Sky and Prasad love to believe they can give or take away my peace at will, and that I have no power over it. How empowering for them! I had a small talk with Sky about it this morning, but the best proof of this is how I react, or don’t react to any of the kids’ antics. from the looks of things, and how the day has started, Sky has already decided that today will be the opposite– he plans on NOT giving me a day of peace. It’s up to me to prove otherwise. Strangely, I’m reminded of all the time Daniel and I like to spend outdoors when the weather is nice. Gardening, digging, weeding, planting, building, creating… we have a zillion projects going on during the weekends, and we often involve the kids. It’s our passion and the kids know this. For some reason, we’re always sensing a great deal of resentment from Sky and Prasad… especially Sky. Sky will get depressed a lot, and mope around the yard even though he has a massive yard to run, explore and play in. Even when he’s asked to help out, he’s very blue. Daniel and I are at our peak happiness level outdoors, and Sky drops into his lowest. Prasad seems to do okay with it, as long as he’s involved in the labor somehow, but he still seems annoyed when our plans for the day are to be outdoors. Isn’t this the opposite of how kids usually operate? I recall loving the outdoors as a kid, not at all concerned with what my parents were doing, and I see so many kids on our street loving it, too. It really feels like they abhor the fact that Daniel and I are SO HAPPY out there. Again, what is the deal with that? I am not demonizing my kids… they’re incredible gems, and we adore every ounce of them. They just prefer that I’m miserable most of the time. When I say “Kids Want Miserable Mommies” what I really mean is that they love the belief that they have the power to rule our moods and responses, and they need to see us engaged in activities that serve them and the family’s needs, not ourselves. When we’re happy (about something unrelated to them), they’re not in control, and they’re not at the center of the universe. 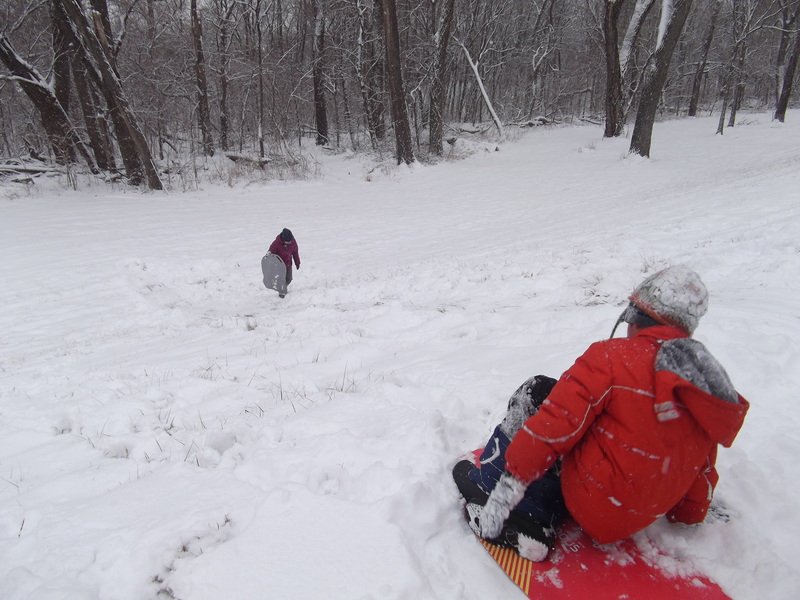 We’ve been hoping for a good, substantial snow so that we can try sledding on the great hill behind our lot. The other side of the levee trail has quite a long slope toward the river, but it’s not so huge that we get exhausted walking up. It’s the perfect sledding hill. 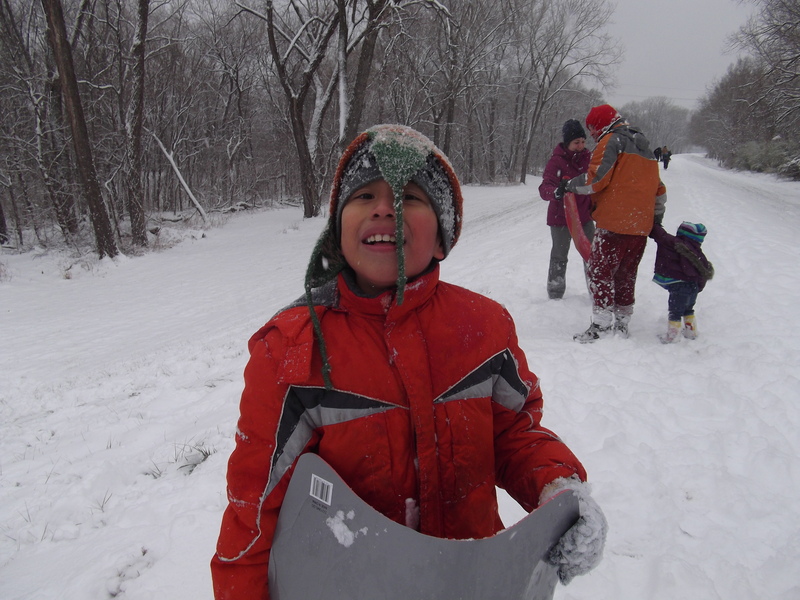 We got our first major accumulation last night, so we had a Snow Day and took the kids out for some fun. 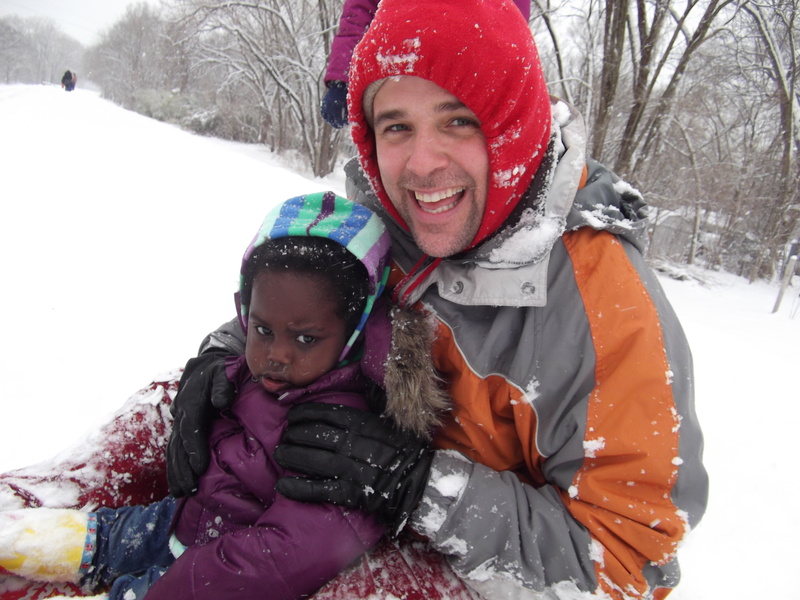 Sledding is one of my most fond memories from childhood, so I had a blast, too! Liam doesn’t do well in snow and cold, and Prasad isn’t in any of these pictures because he wanted to go inside after a few runs down the hill… he was freezing, and his hands hurt terribly. I felt so sorry for him, but after he warmed up, he came back outside and went down a few more times. 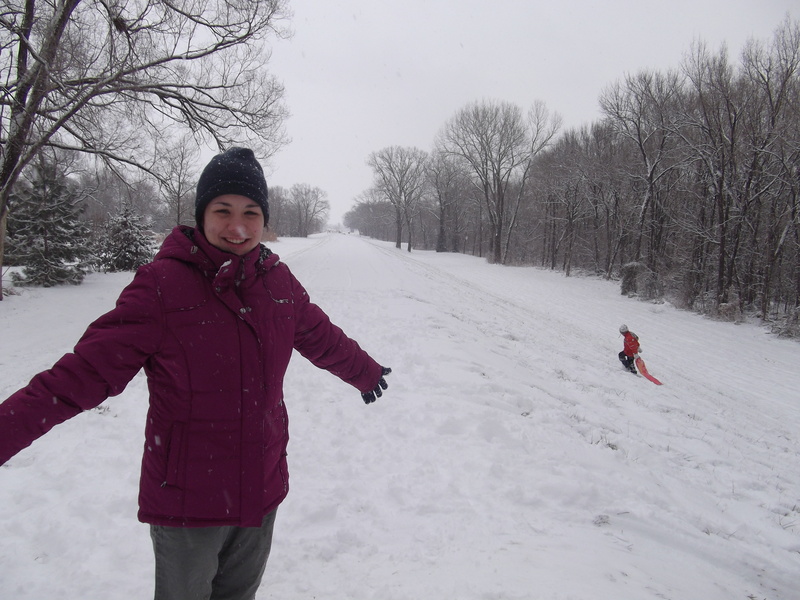 Sorin and I were the last two left on the levee, so we had some 1:1 sledding time. 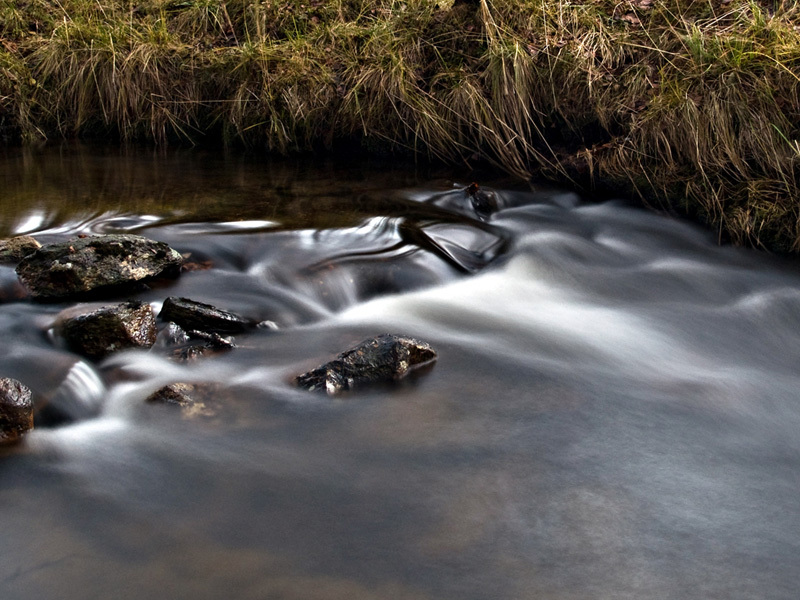 What was most amazing to me was the pure silence and stillness near the river. 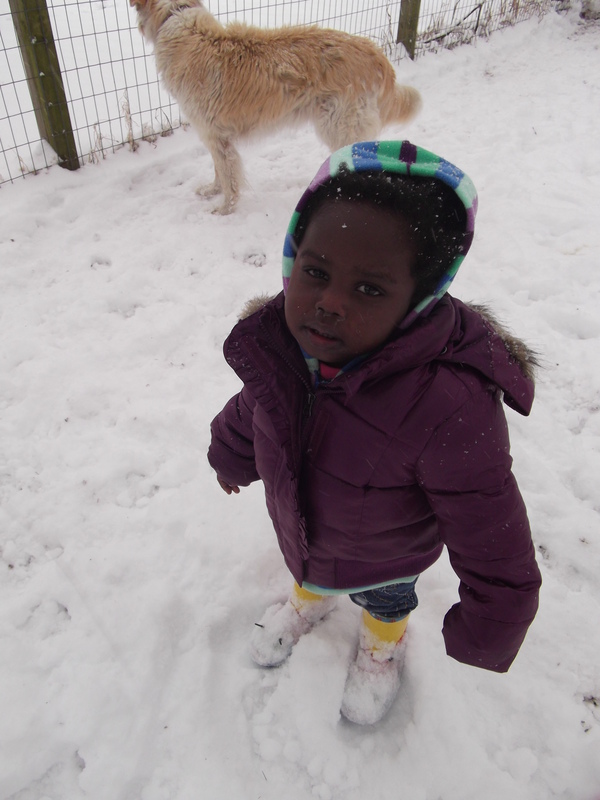 All you could hear was the snow falling… it was nourishing. I love unexpected days like these! 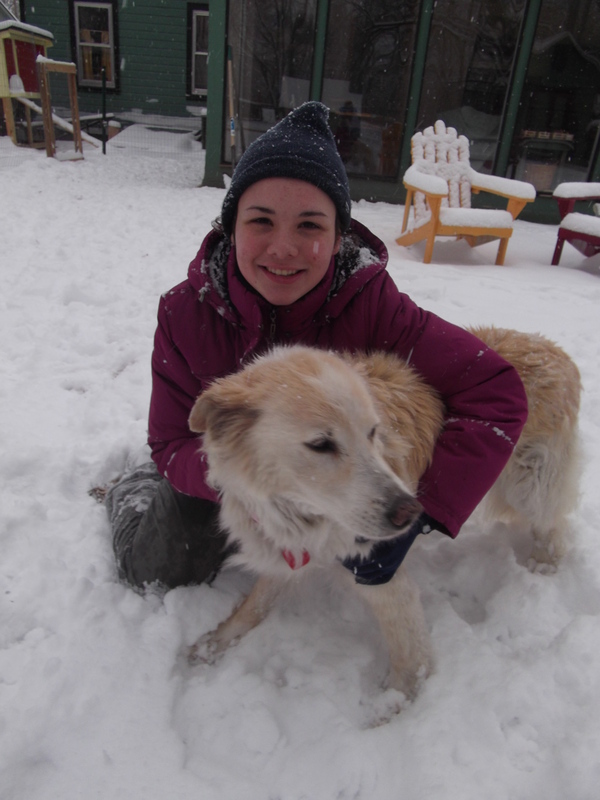 ..and, of course, loving on Emmie in the snow. 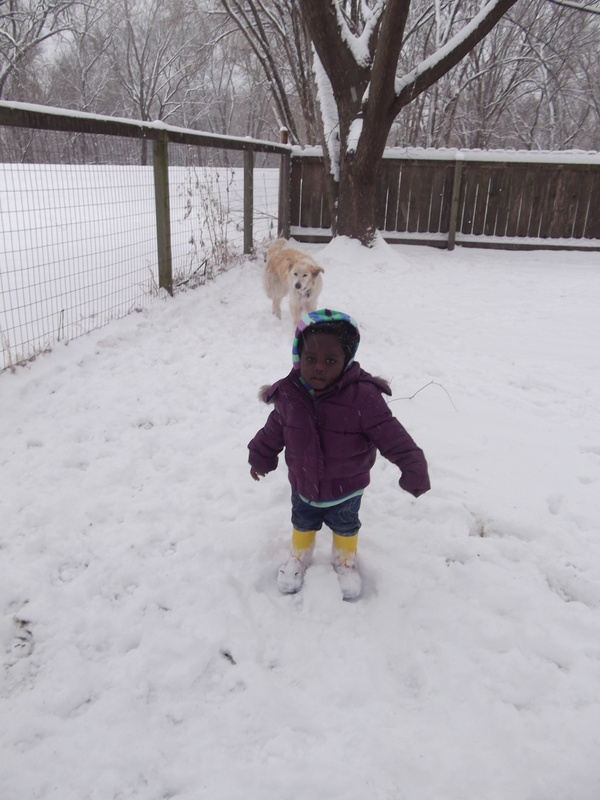 Emmie is very at home in the snow.